Alan Ivimey was a writer and journalist who was also the first presenter of the BBC radio programme “Woman’s Hour” from the first broadcast on the 7th October 1946. The Radio Times introduced Alan Ivimey as a specialist “in writing for and talking to women.” He continued being the presenter of the programme for the first three months when presumably the BBC realised the incongruity of having a male presenter as a specialist in writing for and talking to women and Joan Griffiths took over the presenting role. So what is the relevance of the above to today’s post? The book is from the collection of London books that my father built up and when I was browsing through, I found one of his printed photos tucked in the pages opposite a photo of the same scene in the book. 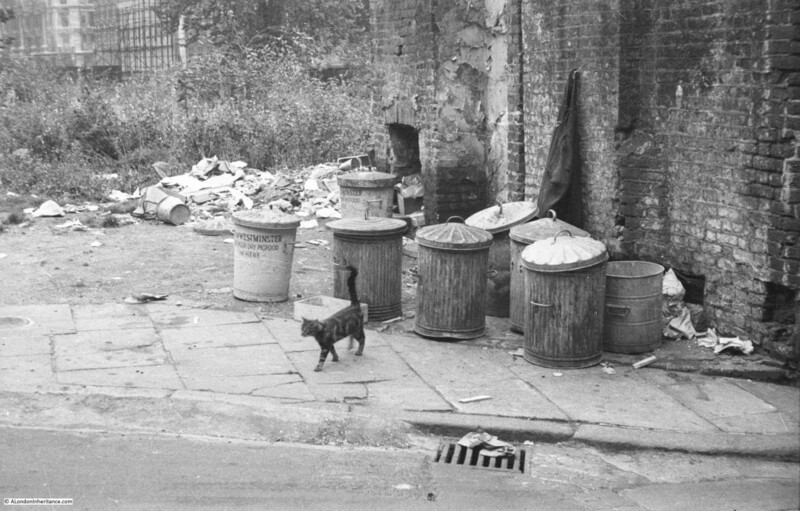 The book tells a story of continuous change in London, but also researching the author provides some background to the social attitudes of the time, also an area of constant change. The photo in question is shown below. This is my father’s photo from 1948 and appears to show the end of a street, signs of bomb damage on the buildings and a missing row of buildings on the right, presumably again lost through bomb damage. This photo has been on my list of photos to hunt down the location as it is not immediately obvious. There is a street name sign to the left of the top of the lamp post with the first two words Hyde Park and the last word hidden behind branches of the tree. I could not find a similar street with the first two words of Hyde Park in any of my pre-war maps. The dustbin on the left has Westminster at the top, so presumably from the council and underneath states that dry pig food should be put in the bin. A leftover from wartime recycling where food waste was used for pig food. Between the Kensington Road, just beyond the Brompton Road fork, and Hyde Park is the narrow entry to Park Row whose 18th century brick and woodwork are painted as prettily as the black-cloth for a scene from The Rivals. 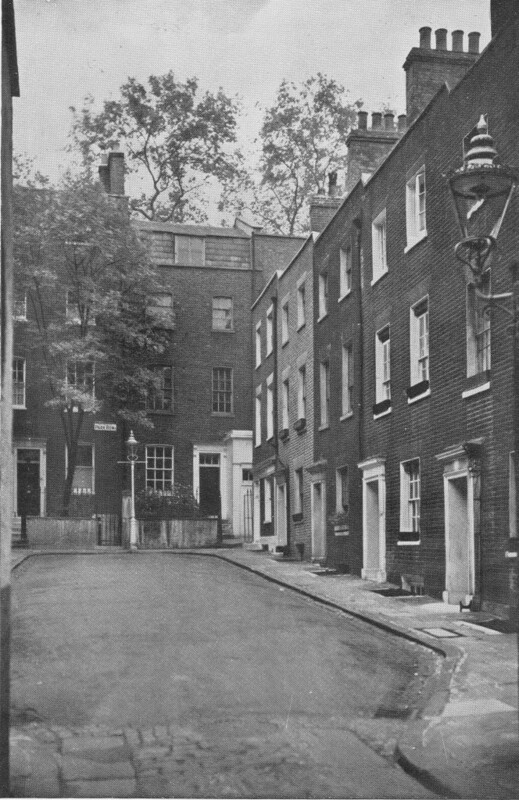 The photo from the book shows the street as it was pre-war. This photo includes the houses that were on the right of the street and are to the same design as the houses on the left, captured in my father’s photo. The second photo above is looking directly at the area once occupied by these houses. This really was a lovely street of 18th century houses. 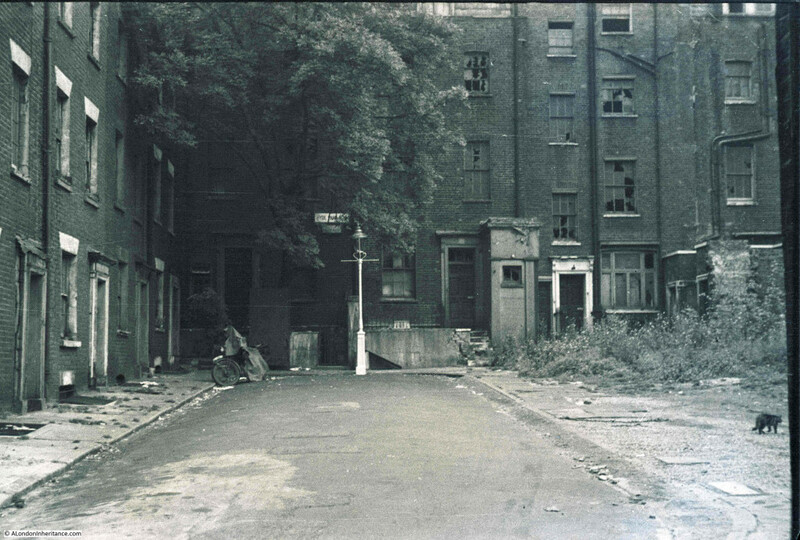 The street name, Park Row, in the photo from the book is different to that in my father’s photo, but this did enable me to track down the location. In the map, the junction to the right is the fork between Knightsbridge and the Brompton Road, with Knightsbridge running past the Hyde Park Barracks into the Kensington Road and Brompton Road heading south. Park Row is shown as the row of buildings at the end of the street, with the opposite side of the Park Row buildings facing onto Hyde Park. The part of the street leading up to the Park Row buildings is labelled Mill’s Buildings in the map. 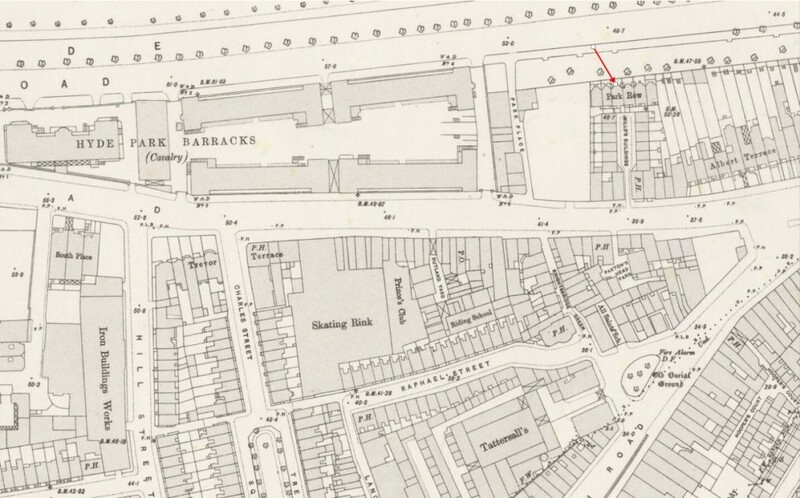 Having found the exact location of Park Row I headed to Knightsbridge to see what, if anything remains, however this small part of Knightsbridge has seen considerable change and Park Row, the Mill’s Buildings and Albert Terrace (shown to the right on the map) have long gone. The 1895 map also shows a Public House almost opposite the entrance to the Mill’s Buildings and the Paxtons Head pub is still in the same position today, also helping to confirm the location. 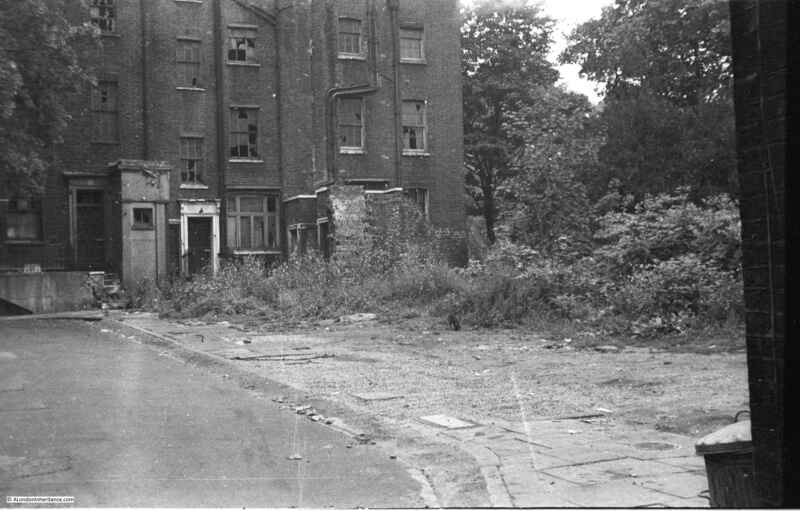 The entrance to the Mill’s Buildings would have been roughly where the white van is in the above photo with the road to the left occupied by the buildings on the left of the original photo. The Park Row terrace would have been towards the end of this street, probably located around the end of the canopy that now covers the street. A considerable change from the original street of 18th century houses. I wanted to know more about this street. I checked the London County Council Bomb Damage Maps to confirm that bomb damage destroyed the buildings to the right, however these maps do not show any damage in the immediate vicinity of Park Row. I have often wondered if the Bomb Damage Maps did record all the bomb damage throughout London as it must have been a considerable task to record every event and area of damage. The Mill’s Buildings were accessed through an alley from Knightsbridge and if the buildings facing on to Knightsbridge were not damaged, I wonder if those surveying the city for damage just did not think to walk through into the Mill’s Buildings? I cannot believe that the buildings was demolished for any other reason soon after the war, with housing being in such short supply. The Survey of London provides more information on Park Row and explains when the name change happened between the photo from the book and my father’s photo. In 1776 Ralph Mills, a Knightsbridge carpenter-builder, took a lease on the original buildings and proceeded to redevelop the site. He built 26 houses consisting of Park Row and the Mill’s Buildings. The houses that made up Mill’s Buildings were superior to those often found in small courts, but by the late 1820s several of the rate payers occupying these buildings were described as ‘poor’ or ‘very poor and aged’. The Park Row buildings, constructed during the same period were of a higher status and had large bay windows facing onto Hyde Park. The Survey of London confirms that Park Row was renamed Hyde Park Row in 1939, but does not identify why the name change was made. The Survey also confirms that Park Row was demolished, but not when. So, thanks to Alan Ivimey and his book, The Romance of London, I can confirm the location of another of my father’s photos, and as suggested by the author at the start of his book, I shall now get out my pipe of tobacco and tankard and finish reading his book with an amiable state of mind. This entry was posted in London Streets and tagged Hyde Park, Knightsbridge, Park Row on December 6, 2015 by admin. Fascinating as always. I really look forward to your articles. Thanks Darren, really appreciate the feedback. Is that road with the odd roof the one to the west side of the ridiculously luxurious One Hyde Park residential development? Edinburgh Gate, I think that road it is called. 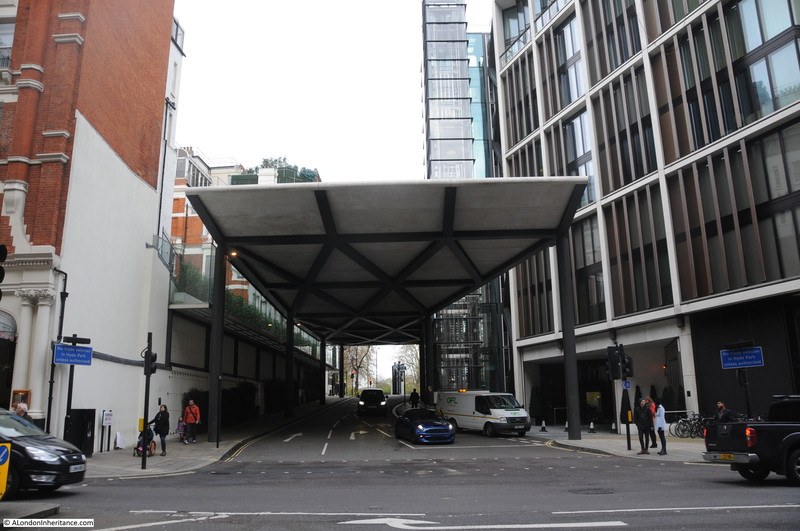 As I understand it, the new Edinburgh Gate was created with the development, to replace the old road of the same name that used to run under Bowater House (the extremely ugly post-war office block that was demolished to make way for One Hyde Park). At the other end is the last sculpture by Jacob Epstein, called the Rush of the Green, a group with Pan and a few other figures. He died about the time it was being installed. The sculpture used to be outside Bowater House. So is the new Edinburgh Gate roughly on the line of the old Mill’s Buildings? Perhaps we should campaign for a return of the old name! Andrew, yes, that is the one, next to One Hyde Park. Thanks for the information and links regarding Bowater House. I did wonder what was on the site prior to One Hyde Park. I see that construction of Bowater House started in 1956 so it was probably this development that resulted in the demolition of the remaining buildings in Park Row and Mill’s Buildings. One way of hunting out development and land use time lines is to look at archived planning application material. I don’t know what Westminster Council has by by of archived material but the planning system was formalised in 1949 and there will be planning applications for sites, demolitions and etc. DO look at ancient planning material as it is full of information of value to local historians. Here in Hove I can go to the town hall and call of planning histories from way, way back when it was all on handwritten cards. Then, using the planning numbers, call off archived planning material which showed one seafront terrace under threat becoming Listed and all sorts about the Local Plan political thinking of the 1960′ and early 1970’s that shaped that area and allowed high rise blocks to replace large houses (which these days would be converted to flats). Really enjoyed this article and whipped out my old Central London Atlas from 1969 to see what still showed there….. I have found a reference to this place on p 85 of “Looking Back on London” by Dorothy Hood. (Very interesting book btw.). It was written in 1932 and in the chapter on Peaceful Ways” it says “In Knightsbridge, turn your back on the thunder of the Kensington Road, go into the tiny courtyard of Park Row, drink in the peace and say farewell to the little old houses with the pretty porches and overdoors, for their time is short.” This implies that they were scheduled for demolition in the early 1930s, and it hadn’t been bomb damage. Pity when you se the hideousness that replaced it.